Keeping your cat cool in summer is just as important as keeping your dog or yourself cool but often owners don’t think of it. Our feline friends are just as susceptible to heat stroke and dehydration (more so than dogs in fact as they are already poor drinkers), and need to be considered on hot, humid days. Make sure that fresh, cool drinking water is available at all times and in various locations throughout the house. If the water is allowed to heat up or become stale, your cat is less likely to drink it; likewise, if your cat has to wander too far in search of a drink, it may just give up and go without. 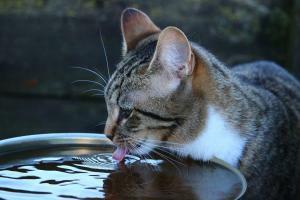 We all know how fussy cats can be and they’re no different with their drinking water. A fountain that circulates and aerates the water is ideal for cats as it provides a continual source of fresh, cool and filtered water. Create a cool, shaded retreat for your cat in the house and garden. It is important that they have somewhere to go when the temperature rises, whether they reside inside or out. If your garden is quite exposed, create a canopy for your cat to rest under or invest in some plants that provide a bit of shade. It goes without saying that cats should always be kept out of greenhouses and conservatories on hot summer days. Avoid car travel as no cat wants to be cooped up in a hot carrier in a hot car on a hot day. Save the journey for a rainy day when your cat is going to be more calm and comfortable. Try to groom daily to remove loose hairs and lift some of the insulating layers that may be keeping your cat warmer. Regular grooming also stimulates the skin to produce natural oils and aids the hair renewal process. Some cats may need their fur trimming, so consult a professional groomer. Beware of sunburn. Pale-coloured cats are more likely to burn, especially on their noses, ears and sparsely covered areas. This can and does lead to skin cancer if you’re not careful, so remember to use a pet-friendly sunblock if your cat is out and about and exposed to the sun. If you notice any of the following symptoms, it’s possible your cat has heat stroke and you should seek your vet’s advice immediately: lethargy, vomiting, rapid heart rate and breathing, staggering gait, excessive grooming (to cool off), sweaty paws (like dogs, cats sweat through their paws), and high rectal temperatures (exceeding 105 degrees Fahrenheit). Use cooling mats, damp towels, fans, ice cubes in water bowls etc to keep your cat cool. Elevate your cat’s bed for air to circulate beneath it, close the curtains, keep your cat indoors between 11-3pm when the sun is at its hottest, and postpone playtime until the cooler hours. Stroking your cat with a wet hand from behind also cools them down.